Residential and commercial building or yard construction can cause damage to trees and shrubs when left unprotected. By learning the potential harm to trees by such activities, you can minimize construction damage and save your trees and money, all at the same time. Damage from construction vehicles is usually on a tree's trunk and crown and results in ripped bark, broken and torn branches, and trunk gashes. Tree roots grow out away from the tree mostly within the top foot to three feet of the soil profile. A tree's root network can extend outward horizontally as much two to three times past the outer-most tree limbs. These far reaching roots act as anchors for the tree. Any kind of damage such as root cutting will inhibit the tree's ability to hold itself up during strong winds and storms. Other damage on job sites such as removal of roots and root disturbance is caused by tunneling, digging, and trenching too close to trees. Root smothering is caused by soil grading and back-filling. Probably the worst type of damage sustained by trees on construction sites is soil compaction. The action of heavy trucks and machines rolling across the job site minimizes "pores" and spaces in the soil. These spaces hold valuable water and air - elements necessary for tree roots to grow. During the development stages of a construction project, consult with a certified arborist. They can review the property and provide information and services to you and your builder on how best to protect trees on the property. Certified arborists can advise you on which trees may be transplanted or permanently removed. 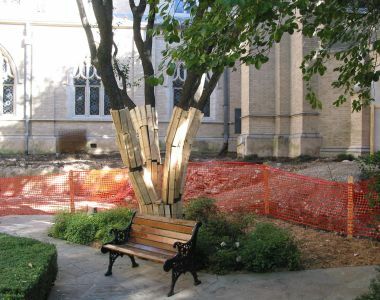 Certified arborists know best how to correctly protect trees on a construction project. 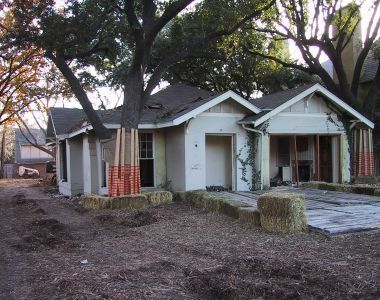 They will craft a tree protection plan to minimize damage to your trees during your construction project. Most arborists will disallow any digging or trenching near designated trees, secure groups of trees with fencing, and ensure no construction waste or additional soil is piled around trees. Include in your construction specifications and contract any special language for tree protection requirements. Ensure that the architect, builder, builder associates, and certified arborist all understand your tree protection plan. Ask what the limitations and warranties are of your tree protection plan. Verify insurance and licenses of all construction personnel, builders, and certified arborists working on your project. Request and check all references and credentials of key personnel. Ask your arborist about any necessary post-construction tree maintenance.